Today in the mail was a package, one I was truely not expecting. It’s from my “secret pal” in the No Sheep For You SWAP. 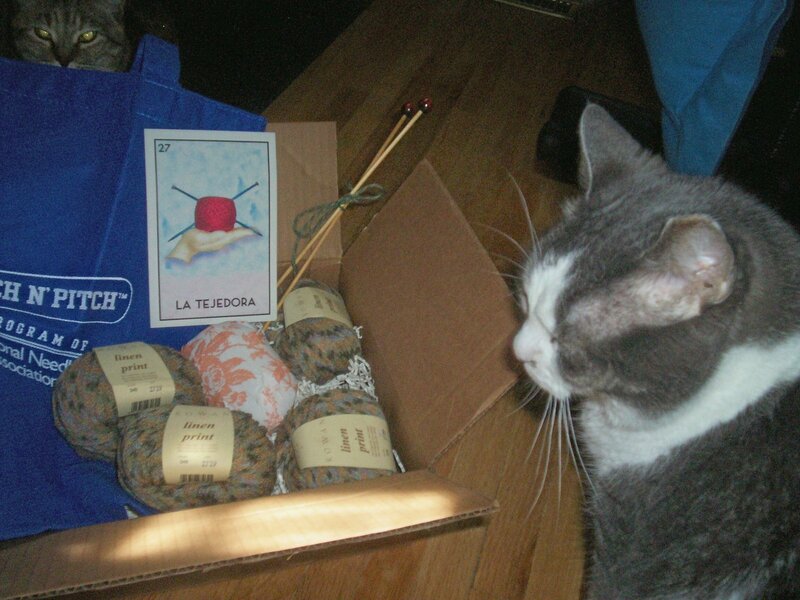 The package was not only enjoyed by me but as you can see Frankie and Beatle took to it as well. I wasn’t expecting so much stuff, I really have to send out a big big thank you to SvenGirly who totally made my week. I’m using some Alpaca from a local Alpaca farm that I got at the Golden Willow. It’s an insanely goregous black grey (the camera really doesn’t catch the greatness) 80% alpaca/20% merino. Mom got me it for my birthday. Now only will it keep me warm when i am cold but it also helps support local alpaca farmers (which I am more than all about). Here is one of the front peices finally being blocked… as well as a close up of the designs on the front of the siewash. I know it looks big but it is for a 4XL person whose measurements I have on hand. 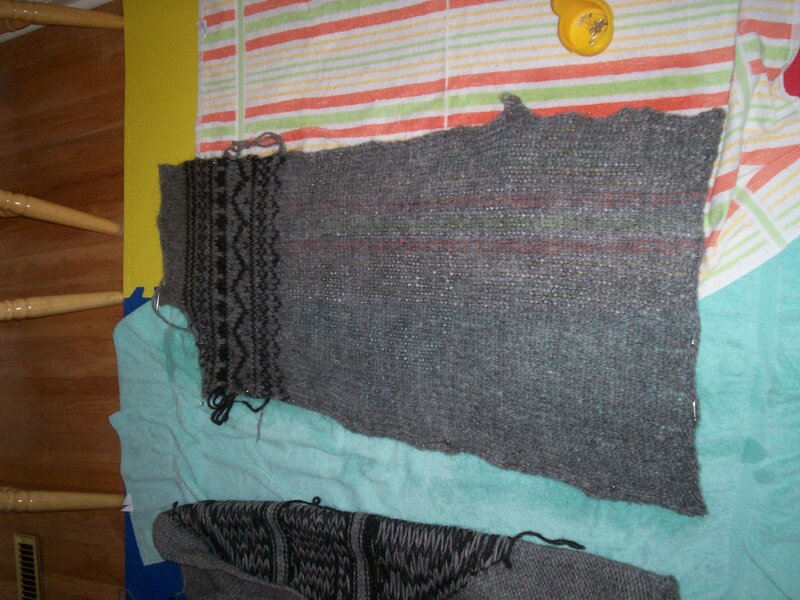 Once I’ve blocked both peices it’ll be onto the sleeves and then it’s all button bands and collars and seaming. Leg: 7 inches un-stretched 10 inches stretched. Round 1: [K1, p1] to end. Repeat Round 1 for 1×1 Rib. Slip one stitch knitwise, knit one stitch, pass slipped stitch over. Using long-tail cast on, CO 71 sts. Divide stitches as evenly as possible across needles. Join being careful not to twist stitches. Work in 1×1 rib for 1 inch. Round 1) P2, K2tog, K3, YO, K1, YO, K3, Sl1-K1-Psso *P3, K2tog, K3, YO, K1, YO, K3, Sl1-K1-Psso, Rep from * to last two stitches, P2. Round 2, 4, 6, 8) P2, K11 *P3, K11, Rep from * to last two stitches P2. Round 3) P2, K2tog, K2, YO, K3, YO, K2, Sl1-K1-Psso, *P3, K2tog, K2, YO, K3, YO, K2, Sl1-K1-Psso, Rep from * to last two stitches P2. Round 5) P2, K2tog, K1, YO, K5, YO, K1, Sl1-K1-Psso *P3, K2tog, K1, YO, K5, YO, K1, Sl1-K1-Psso, Rep from * to last two P2. Round 7) P2, K2tog, YO, K7, YO, Sl1-K1-Psso, *P3, K2tog, YO, K7, YO, Sl1-K1-Psso, Rep from * to last two stitches P2. Round 9) K1 *YO, K3, Sl1-K1-Psso, P3, K2tog, K3, YO, K1, Rep from * to end of round. Round 10, 12, 14) K6, P3, *K11 P3 Rep from * to last six stitches K6. Round 11) K2, YO, K2, Sl1-K1-Psso, P3, K2tog, K2 *YO, K3, YO, K2, Sl1-K1-Psso, P3 K2tog, K2, Rep from * to last two stitches YO, K2. Round 13)K3, YO, K1, Sl1-K1-Psso, P3, K2tog, K1 *YO, K5, YO, K1 Sl1-K1-Psso, P3, K2tog, K1, Rep from * to last three stitches YO, K3. Round 15) K4, YO, Sl-1K1-Psso, P3, K2tog *YO, K7, YO, Sl1-K1-Psso, P3, K2tog, Rep from * to last four stitches YO, K4. Round 16)K6, P3 *K11, P3, Rep from * to the last six stitches K6. Repeat Rounds 1-16 three times. 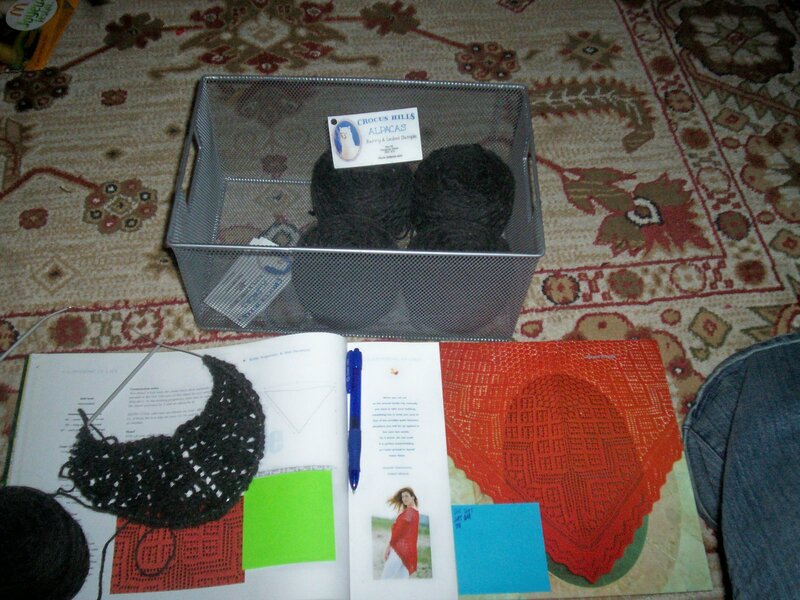 Row 1)Knit 18 sts, turn. These stitches form the heel that will be worked back and forth. Row 3) *Sl1, K1, Rep from * to end of row. Repeat rows three and four 15 times more. You will now have 20 stitches of the heel worked. 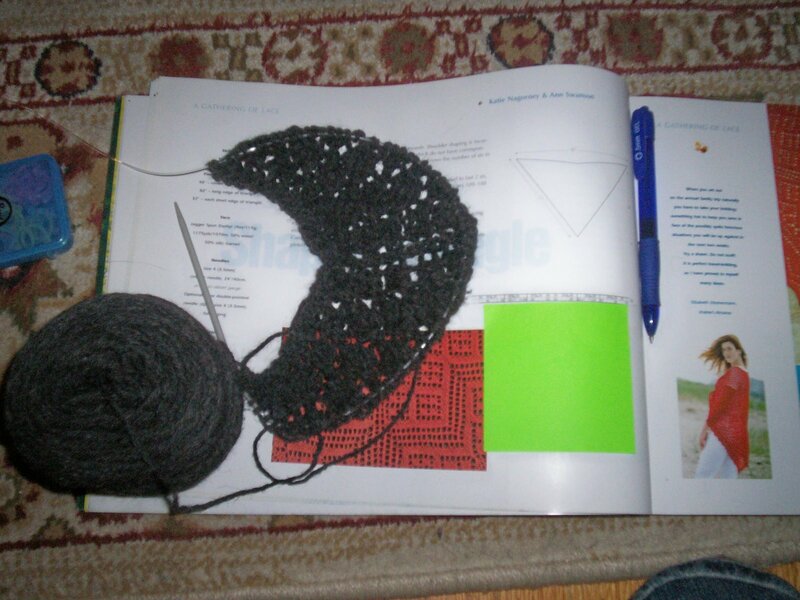 Using one needle knit 10. This will now be the start of the round. 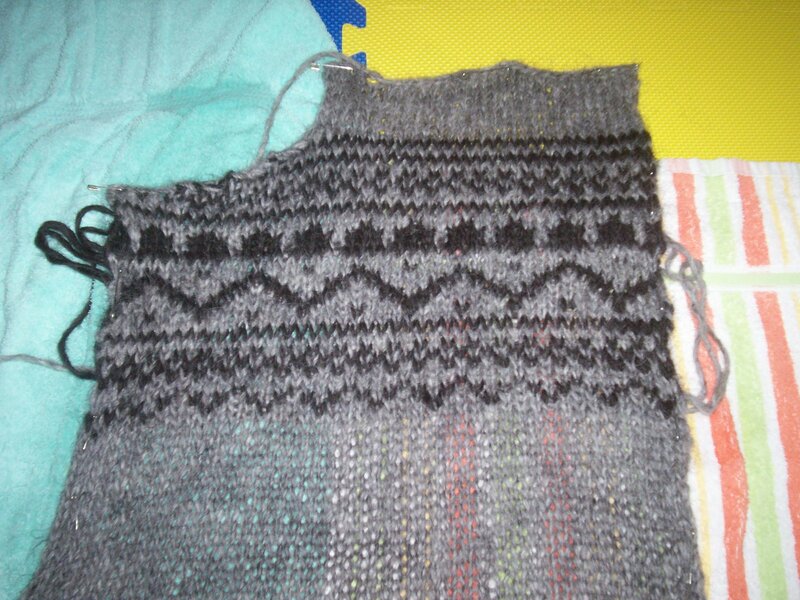 Using a separate needle knit remaining 10. Pick up and knit 16 sts where you have slipped stitches along the edge of the heel. Needle 2 and 3: K2tog, K1, and then continue working established pattern starting with row one until last until last three sts K1, K2tog. 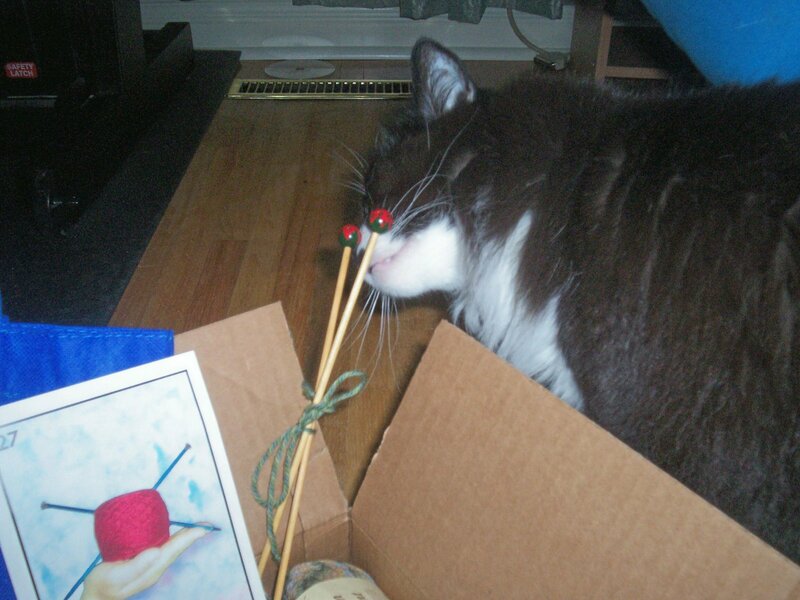 You will now have 33 sts on Needles 2 and 3. Needle 4: Pick up and knit 16 sts and knit 10 sts of the heel ending the round. 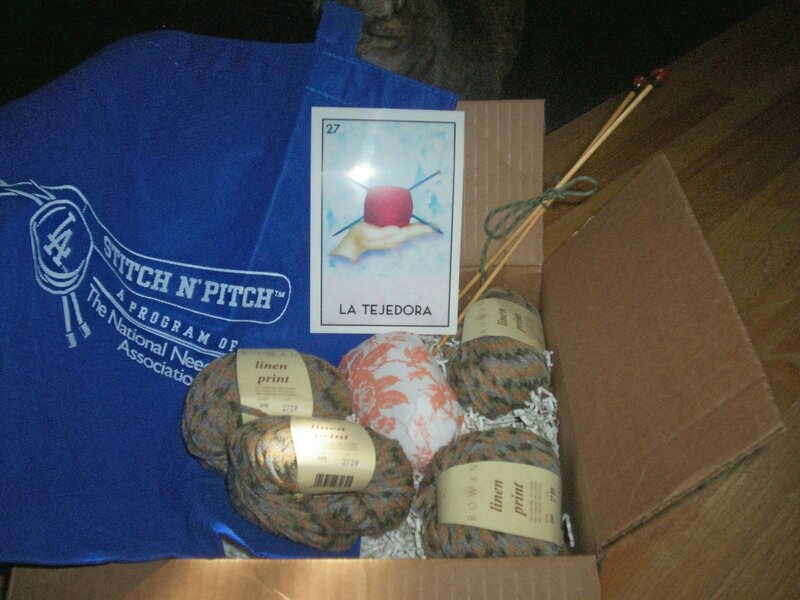 Round 1)Needle 1 knit to last 3 sts on needle one, K2tog, K1. On needles 2 and 3 K2, continue working pattern as established to last 2 sts, K2. Needle 4 K1, ssk, k to end of needle. Round 2)Needle 2 k all sts, Needles 2 and three K2 continue working pattern as established to last 2 sts, K2. Needle 4 k all sts. Repeat Round 1 and 2 until 19 sts remain on Needles 1 and 4. Continue in pattern. Working sts on Needles 1 and 4 in stockinette st and sts on Needles 2 and 3 in pattern as established, until work measures approx. 1.5-2 inches less than desired length. Ending with Round 9, 10, 15 or 16. Use favorite toe shaping method. *Note: This is the first time I’ve created a pattern so bear with me if there are any glitches. 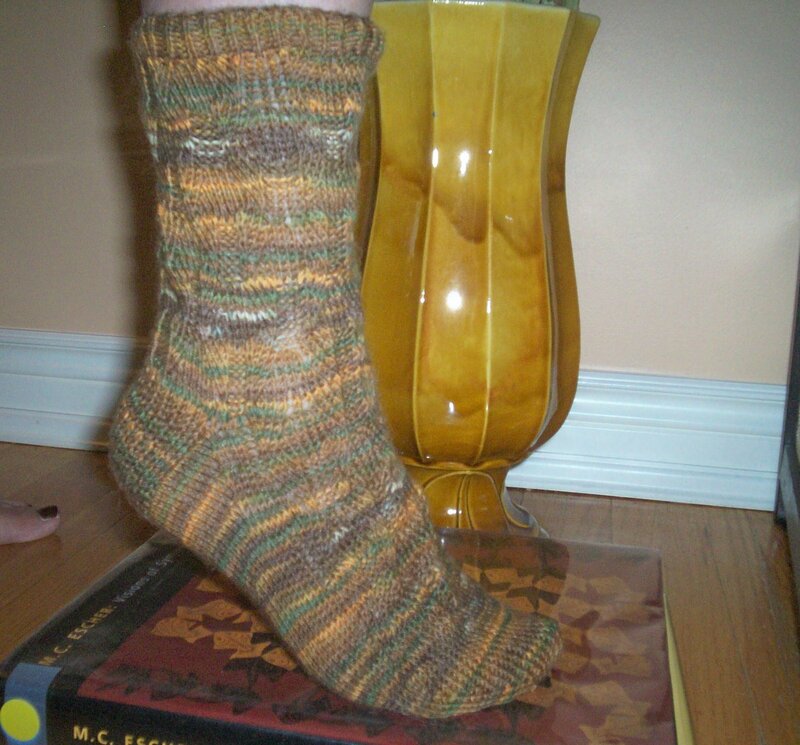 I knitted the second sock based on the pattern which i wrote while i made the first sock.